Inconsequential mysteries are sometimes intriguing. 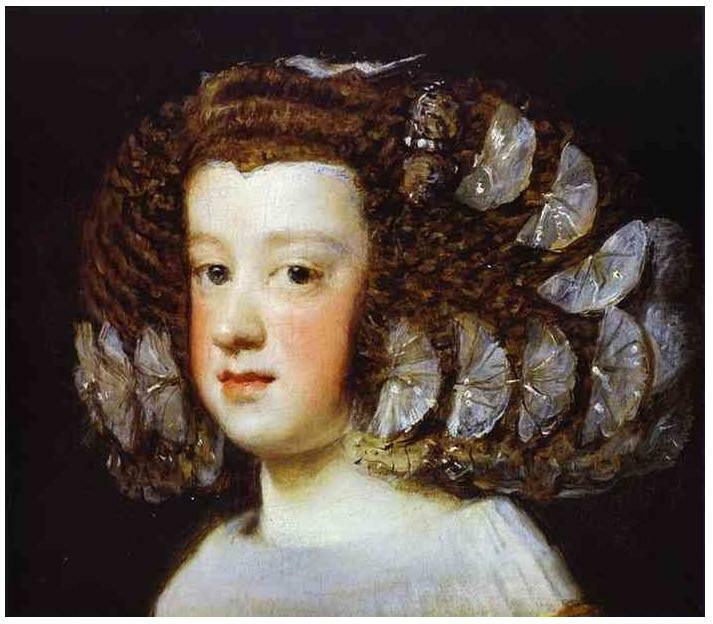 Diego Velazquez (1599-1660) was nothing if not adept at describing both features and spirit in his portraits–as here, the Infanta Maria Teresa. How then to explain the odd face of his Rokeby Venus? “Vague” is not the word for Venus’ face; Cupid’s face is only suggested, but quite in keeping with his body; Venus’ face is lumpy and unresolved. It’s not the effect of the mirror. The back of her head suggests a graceful do, but from the front her hair looks as if she just got done toweling it. Her forehead is higher than it seems from behind. It’s not the face one would expect to find associated with one of the suavest derrieres in the history of painting. Jonathan Brown* notices the oddness of the face, and attributes it to Velazquez’s effort to avoid resemblance to any actual woman. But surely Velazquez, of all people, could invent a face both anonymous and convincing. One possibility, I suppose, is that what we’re looking at is underpainting. The painting has a history of inept cleaning; the face might have been eroded in the process. I throw that in because if one writes about this sort of thing one ought to have a theory to contribute, however far-fetched. But if overcleaning seems unconvincing, and delicacy about the identity of the lady unlikely, how do we explain that face? Another possibility is that Velazquez simply didn’t get it quite right. Maybe he was distracted–he was about to leave for a long trip to Italy. Maybe he was packing, wondering how many shirts he’d need, and didn’t have time to go back and contemplate the finished piece. Dealing with an artist of his grandeur, the normal assumption would be that he had good reasons for doing what he did, and if you don’t get it you should keep trying. But even great artists are human, and sometimes that assumption is contradicted by the evidence.